If you're thinking of playing with Gala Bingo, you'll notice that there's more than one way to go about it. You can get your bingo fix in person at a Gala Bingo Club, play online via your computer or download the app to play on your mobile or tablet. In case that sounds a bit confusing, we've broken it down for you so you know exactly how and where to play with Gala Bingo. To play online, simply head to the site at GalaBingo.com and start by registering an account. After clicking Join Now, you can create an account by filling in the registration form. Once you have a Gala Bingo account, you can play by downloading the site software to your computer or online through your browser. When you use a special promo code (New customers only / +18 / T&C apply), you will receive an extra £30 in your account as a welcome bonus after making a first deposit of at least £10. So once you've set up your account, what can you play? There are more than 20 rooms of 90, 80, 75, 50 and even 40-ball play with branded games like Coronation Street and Deal or No Deal. The games are all designed with high-quality graphics and sound and are mostly available 24/7, so you can make the most of the site whenever you want. As well as a welcome bonus, there are several other offers and deals to take advantage of as you play. The Stairway to Heaven bonuses are available on Wednesday evenings between 6pm and 9pm. If you score a 27, 67 or 78, you'll receive the same number in pounds in your bank account. So a number 78 will win you an extra £78 to play with. Not bad. Gala Bingo also has over 250 slot games to play on. There's a great range of options to choose from, including fantasy (Thor’s Thunder, Medusa, Alchemist’s Spell); TV (Britain’s Got Talent, The X Factor, Emmerdale); and casino-based games like Roulette and Live Blackjack. Like most operators now, Gala Bingo is fully available and ready to play from your smart phone or tablet device. 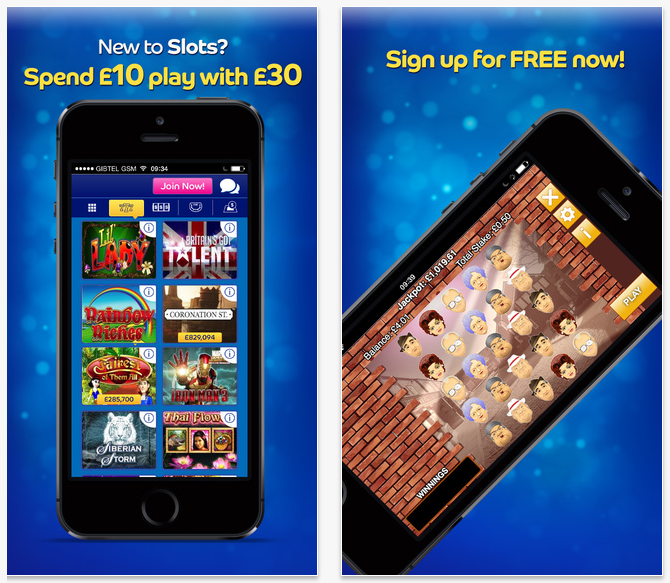 Just head to the App Store on your iPhone, iPod or iPad to download the Gala Bingo app. It's free and provide all the same features and playing options as the desktop site. Android users can also download a compatible app from an Android app store like the Play Store. You can use the same login details on the Gala Bingo app as for the site, so there's no need to choose. This means that your account details and funds are both readily available from both platforms. New users to the mobile or tablet apps are also eligible for the welcome bonus, so you can use the promo code here too. If playing online isn't really your thing, there are lots of Gala Bingo Clubs up and down the UK where you can experience the excitement of playing bingo in real life. On the website, you'll find a Club Finder tool which uses your postcode to locate your most convenient venue. From there you can get all the information you need about your local club, including opening times, facilities, prices and special electronic packages to purchase exclusively online. Session times vary from club to club, but each venue tends to have a morning, afternoon and evening event each day, every day of the week except Sunday when the sessions are more limited. There is an entry cost to play, which is usually under £5. To join a Gala Bingo Club, you need to go along to the venue and register in person. Membership is free and the process only takes a few minutes at the door, all you'll need is a form of ID to prove that you're over the age of 18. Once you've joined, you'll be given a membership card. Keep hold of your membership card to gain entry to the club each time and to claim your winnings when you get lucky. It's also easier to create an online account with your existing membership number, if you have one. If you choose to play in person at a club, there are some offers you won't find online. Check the website regularly for news on special events at your local club, like special bingo weekends with extra sessions and competitions for prizes including bingo cruises and a free dinner. Live Chat is also available from the site.